There was a time when building your own computer was an impractical pursuit that required the incorporation of peripherals that were at once too expensive and also hard to install. With the advent of the modern PC, many computer enthusiasts have eschewed premade setups and gone to the workshop to create gaming and professional machines that perform better than many of the sometimes overpriced devices that you can buy from companies like Dell and Asus. With any of these machines, you’ll need a great case that will provide a home for your disparate peripherals and also grants adequate cooling for all of your overclocked components. To make your search for a great case easier, we’ve collected some great cases in this guide that will serve you well in your next build. Three of these are more premium options, and the final is something you can consider if you are ballin’ on a budget. NZXT is one of the leading producers of tower cases and has been in operation since 2004. Their Phantom line of cases has quickly become one of the most popular case lines on the market today for gamers and for good reason. 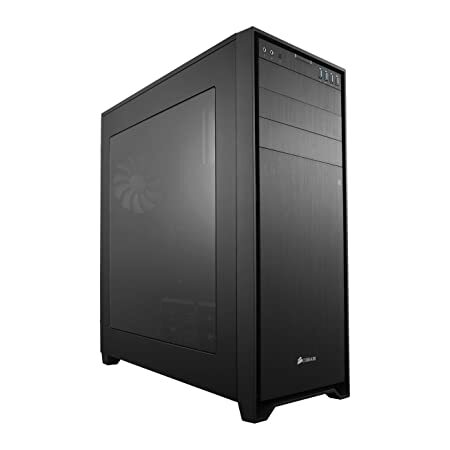 This full tower case is brimming with useful features for case enthusiasts of every caliber. Firstly, this is a very modern and aesthetically pleasing looking case. It utilizes a gunmetal gray and minimalist construction to really make your computer look high tech and powerful. For the most part, this computer case is comprised of plastic for its main surfaces, and metal for its numerous meshed areas. The whole case, as a full ATX tower, measures in at 25.6 inches in height, 24.1 inches in depth, and 9.2 inches in width. The chief embellishments are a slightly angled front and mesh venting that is present on the front, the sides, the top, and the back of the case. By way of the internal LED Hue lighting, this is also a very visually mutable computer case. Simply turn the dial that is hidden under the front panel, and you’ll be able to choose the color of the internal lighting. For those who like to keep an eye on the action, positioned near this internal illumination is a door that has three specific design notes that make it easy to see what’s happening inside this case. The topmost embellishment is a plexiglass window that makes it easy to see the multicolored LED. Underneath that are two large pieces of metal meshing; through these, you’ll be able to see the 20mm cooling fan that attaches to this door and some of your computer’s internal components. When it comes to case features, this device has numerous options for your computer build. Firstly, cooling is taken care of right out of the box. There are four included fans, including the 20mm door fan, which will ensure that your computer is optimally cooled. In addition to the mesh sections that we’ve already mentioned, there are also circular grommets for the addition of a water cooling system, just in case you’d like to overclock. Externally, you’ll find plenty of options for connectivity and enhanced functionality. Underneath the main hatch where we find the HUE lighting adjustments, you’ll also find four 5 ¼ inch slots for optical drives. These come covered in a metal meshing that you can remove as you expand. Positioned at the top of this case there are an amazing six USB connectors, two of which are USB 3.0 and the remaining four 2.0 connectors. On the other side of these connections, there are large buttons to power on/off or reset your rig, headphone and mic jacks, and a four channel fan setting for greater control of the four included system fans. At the bottom of the case, NZXT included two fans that have a removable filter that will help you keep this system dust-free. Along the back bottom, you’ll discover that the manufacturer utilized a bottom mounted power supply system, which is also provided with a filter, so that any dust that is output by your PSU fan is collected at the bottom of the unit and easily removed by pulling out the tray. Simplicity was also heavily considered in the design of this model of Phantom computer case. All lockable components are secured by thumbscrews. This includes the nine PCI expansion slots, and the three screw holes that keep the door secured to the case. “Large, Spacious, and very quiet (The stock fans). You can fit just about anything inside of it, it is easy to clean due to the doors and dust trays. Initial installation was quite the drag, but it was worth it. The manufacturers of the world’s first turbine cooler, Thermaltake has been innovating in the cooling field for almost two decades. As a well-known producer of cooling systems, Thermaltake has also moved into manufacturing the housings of their cooling systems and now has an extensive line of computer cases, which are feature rich and renowned for superb functionality. 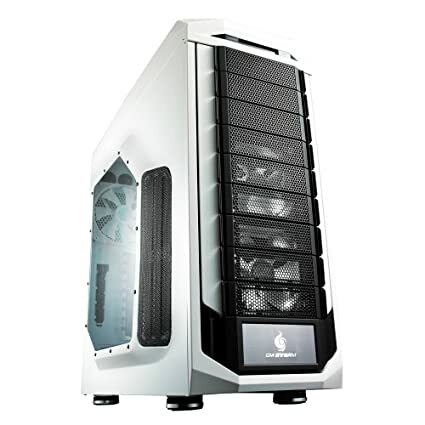 Our Silver Pick product, the Chaser A71, has quickly become one of the most famous of Thermaltakes extensive line of computer cases. The winner of the reddot design award in 2013, this case has all of the features that you’ll need to overclock your system with ease. This overclocking functionality is made so easy because this is one of the rare cases that actually employs water cooling directly into its design. The end result is a very cool case; literally and figuratively. As a full tower case, this unit is quite large. It measures in at 21.1 inches in height, 8.7 inches in width, and 22.2 inches in depth. Aesthetically, it has several features that set it apart from other, comparable cases that are currently available. Firstly, you’ll notice the seven rectangular “drive bays” on this case. While these aren’t actually all actual drive bays, there is expansion available for four 5 ¼ inch drives, such as optical drives and raid controllers. The remaining rectangular mesh-filled bays are actually air flow vents for the front-facing fan that is positioned underneath. When it comes to connectivity, this case does something that is very rare in cases of this type: it actually provides connectivity for standard hard drives by way of a top mounted docking station. Simply, take any SSD or SATA-based drive and lower its connective end into the dock that’s mounted under a hatch at the top of this device, and you’ll have nearly instant connectivity. This functionality will allow you to quickly connect to an extra hard drive when you need to transfer files quickly. Underneath this docking station, you’ll find the fairly standard connectors and buttons such as, two large switches for powering the device on and off and a reset switch. In this section you’ll also find a CPU LED to provide a visual indicator when your processor is active and four USBs, two of which are 2.0, and another two 3.0 connectors. Some other great features of this case are a transparent plexiglass window along the side door of the case, which also has a mesh section along its back-left edge. This mesh section is the housing for the case’s 20mm fan which runs at a fairly whisper-quiet noise output. As you might have guess with the inclusion of the 20mm cooler, this case also incorporates air cooling into its design. Inside the case, there are actually two additional LED illuminated fans that will keep your computer’s internal temperature fairly frosty. “Just built a new PC with this case. Has good options for mounting liquid cooling radiators. Fantastic cable management due to all the eyelets for tie-downs, plenty of holes, and extra space under the side cover. Cooler Master is another one of the giants of cooling who has expanded their line of products to include computer cases. Founded in Taiwan in 1992, Cooler Master first began production of its Storm series of computer cases in 2008. Since then, The CM Storm line of cases has become an industry darling that continues to provide gaming-ready experience for case mod enthusiasts. White and black are the two colors used in the design of this computer case. One thing you might notice, when looking very closely, is that the top and front of this case is comprised of a white plastic, while the side panels are actually made of a white painted metal. There is a slightly disjointed look when comparing the two whites, but it’s not that noticeable when viewed from more than a foot away. The entire case measures in at 23.8 inches from front to back, 9.8 inches from side to side, and 22.8 inches from top to bottom. The second thing that you’ll notice is the very prominent handle at the top of this device. Since this case is designed for making the trip to LAN parties, this handle (coupled with the small handle in the back) really helps make hefting this case an easy prospect. This portability feature is coupled with a relatively light weight for a full tower case; this unit weighs about 30 pounds. Finally, the plexiglass window on the side panel door of this device is the largest that we’ve featured so far. It has a very modern-looking angled design that really gives you a great view of the case’s internals, including its LED illumination. One of the most unique features that Cooler Master has included with this case is the 2.5 inch Hot Swap SSD drive connector that’s positioned above the drive bays. This extra feature will allow you to swap out SSD hard drives in a way that’s reminiscent of swapping out a floppy. While the Silver Pick has a port that allows this, this Cooler Master unit does it in a slightly more intuitive way. In addition to this, this case has four USB adapters of the 2.0 and 3.0 variety, a pair of headphone and microphone jacks as well as a dedicated console that both allows you to power on the system and control the speed of the case’s six on-board fans. In addition to these control features, you’ll find that this case employs nine 5 ¼ inch drive bays and features the Cooler Master standby; a set of tools that fits neatly into a compartment at the base of the unit’s body. The included tools are a few mounting brackets, thumbscrews, and some drive sleds. Our final, ballin’ on a budget entry comes from the engineers at Corsair, a company who specializes in not only producing quality cases, but is also known for creating some of the best RAM on the market today. 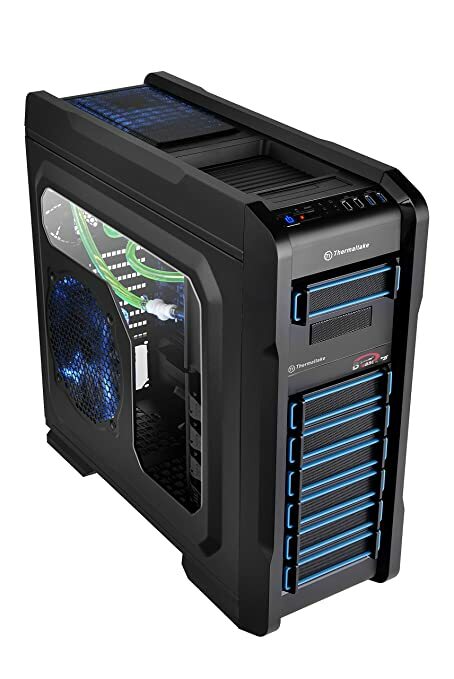 This full tower case has some great construction; the main body is actually comprised of cooling-friendly aluminum and it features the largest side panel plexiglass window of all of the cases in our guide. 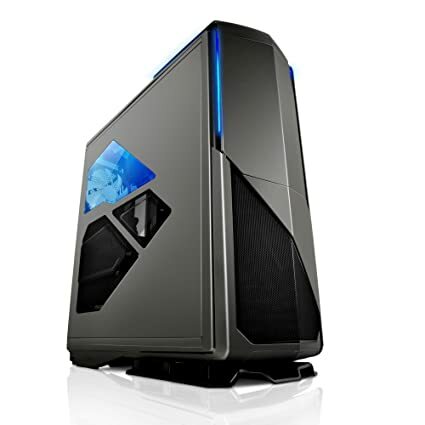 To start, Obsidian is a great name for this series of computer case, because with its dark coloring and brushed aluminum externals, it certainly appears reminiscent of the dark stone that it’s named after. Like other cases on our list, it has four USBs that are split evenly between 2.0 and 3.0 configurations, and it also has three 5 ¼ inch drive bays for optical or raid expansion. You’ll also notice two white asterisks on the front; you can press these in order to remove the front paneling of the case, which will reveal the two front exhaust fans and the removable, cleanable dust filter. Corsair has ensured that the device is easy to upgrade by providing each PCI slot and panel attachment with easily rotatable thumbscrews. The power supply rests at the base of the case and also includes a removable dust filter, so that you can keep your PC nice and dust-free. Water Cooling Systems – This is a type of system that provides a high degree of heat dissipation, though springing a leak inside of your computer can certainly cause a major disaster for your computer. These types of coolers remove excess heat from your system by pumping water through a series of tubes. The tubes run throughout your computer, nearest to the hot components and siphon off the additional heat, which is then expelled from the system’s radiators. This is the perfect setup for overclockers, though it costs a bit more than traditional fan-based cooling. Built-in Fan Cooling – These differ slightly from aftermarket purchased fans because the case manufacturers build these into your case with a special attention to hot zones that can form inside your computer. These devices simply cool by directing an internal airflow into the case, cooling your components greatly. Immersion Cooling – Certainly the most extreme system of cooling but provides the most heat dissipation. This system fully immerses your hot components in an oil bath that is designed to disperse ambient heat throughout the substance. The oil is thermally conductive, so that it disperses heat, but not electrically conductive, so that it won’t fry your components or pose any danger to you while in use. This type of cooling is fairly rare and requires spill-proof cases. Mounting Points – This will let you zip tie your cables to dedicated mounting points located at various places on the case. If you find yourself consistently struggling with multiple useless cables, this is the perfect solution for finding a place for them. Cable Cutouts – This solution provides set, rubber coated sections of the computer case to safely store your cables. The edges employ this rubber coating so that your cabling doesn’t get chaffed by the edges of the metal. Cable Cutaways – These are dedicated stow areas for cabling that some manufacturers include in their cases. Typically, you’ll be able to route your cabling through a special cutaway section that will allow you to store the extra cable behind the mainboard of your PC. Anyone who’s put together a PC using a Phillips screwdriver knows how convenient PC cases that utilize tool free construction are. These cases usually use locks for add-on boards that you can simply slide the metal ends of the board into without the need of additional screws or tools. These also utilize drive sleds for your optical and hard drives that allow you to simply slide them into locking position, once again, eschewing the need of a Phillips and screws. These types of cases also employ thumb screws to close the case, though some use a locking system to ensure that you’ll never have to use a tool when making adjustments to your PC again. For the most part, this is an aesthetic concession that many case manufacturers make in order to please their customers. For those case modders who like to see the action in their PC, this is a functional option for them as well to get an idea if a fan isn’t turning or if there is burn damage to the motherboard. Though typically, this is just a window to display any lighted elements such as fans and power supplies that you’ve employed inside your PC. Having a quality case that’s at once beautiful and functional is the desire of any DIY computer owner. The cases that we’ve featured in this guide will grant you years of stable performance and a high level of component cooling, so if you’re looking for quality, don’t neglect these wonderful models. If these aren’t for you, still utilize our pre-purchase considerations to find a case that’s more up to your specifications. In any event, as your new computer comes together, we hope that we’ve helped you make an informed decision for your future device’s housing.